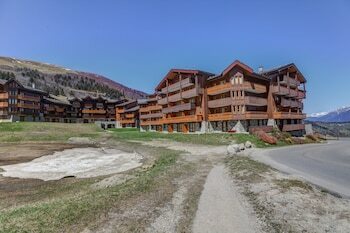 With a stay at Pierre & Vacances Residence Athamante & Valeriane in Les Avanchers-Valmorel, you'll be near ski lifts, just a 1-minute walk from Grand Domaine Ski Resort and 9 minutes by foot from Telebourg Gondola. The front desk is staffed during limited hours. Limited parking is available onsite. A stay at Hotel de la terrasse places you in the heart of Berck-sur-Mer, a 3-minute drive from Berck Beach and 7 minutes from Parc Bagatelle. When you stay at Au chien Bleu in Lombez, you'll be 8 minutes by car from Samatan Fountain. The front desk is staffed during limited hours. Free self parking is available onsite. With a stay at La Maison Colline in Saint-Emilion, you'll be just steps from Gate of Cadene and Cordeliers Cloister. When you stay at this vacation home in Cadenet, you'll be close to Silvacane Abbey. With a stay at Hôtel Notre Dame de Fourvière in Lourdes, you'll be within a 10-minute walk of Rosary Basilica and Notre-Dame de l'Immaculee-Conception. Free self parking is available onsite. With a stay at Europea - Invalides, you'll be centrally located in Paris, convenient to Les Invalides and Eiffel Tower.